Sometimes it is hard to find the perfect location for photos on your special day. Where did you go to take photos of your wedding day? 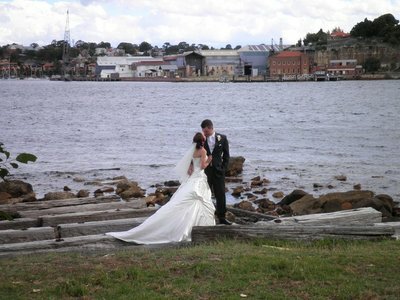 or maybe you know of an iconic Sydney location that provides the perfect back drop for the big event? Vaucluse is lovely, and although busy - Sydney's Hyde Park is every popular. Chiswick Park at Rodd Point is also lovely as it overlooks the bay. Woolwich pier is beautiful! It has both bush and harbour views as well as industrial and beachy backdrops. If it is a little cloudy outside don't worry because photographers say this makes for better photos! For a small wedding Banjo Pattersons at Gladesville is by the water and I've been lucky enough to attend a couple of weddings there. You can have the ceremony by the water on the luscious lawns and then the reception inside in a very intimate setting. I love wedding where the bride and groom sit with the guests for the reception afterwards. If you're looking for something a little different and extra special, the Chinese Gardens in Darling Harbour would make a gorgeous location for wedding photos. These lush gardens border a picturesque lake, complete with waterfalls, waterlilies, and koi carp. One of the best places in far western Sydney to take wedding photos is along the shore of the Nepean River. In Victoria Park, near the Nepean Rowing club, is a beautiful old world bandstand that makes for some great framing devices, with the river flowing in the background and the Blue Mountains as backdrop.